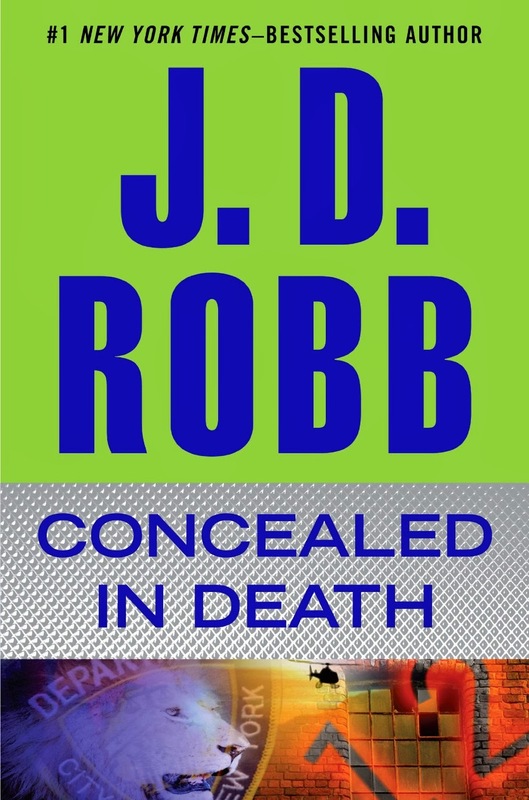 Regular readers of the In Death series may be somewhat surprised to find that this latest installment opens with Roarke, Lt. Eve Dallas’s wealthy husband. He’s in an old building he’s having rehabbed. When the contractor encourages him to take a ceremonial first swing or two at a wall that’s coming down, Roarke obliges, but what the wall is hiding shocks them all. Behind it lie the bodies of twelve young girls. Figuring out why and how they came to be there and catching their killer take Eve and company on a journey through the past that reminds both Eve and Roarke of their own painful childhoods. The previous book in this series, Thankless in Death, has become a favorite. When that happens with any book in a series, it sets the bar high for the next one, so I was a bit nervous going into this book. Concealed in Death clears the bar, though. The mystery is tightly constructed, and most of the regular characters appear at least briefly. Robb also introduces a new character, forensic anthropologist Garnet DeWinter, a fashionable, renowned doctor who doesn’t always share Eve’s views on case management. As Eve’s investigation moves to the youth shelter organization that formerly occupied Roarke’s building, we meet a clever, young girl who’s living there, Quilla. It’ll be interesting to see whether she’s a single-shot guest or will become a recurring character. We also learn more about everyone’s favorite ex-grifter and music vid star, Mavis Freestone. Her revelations mesh perfectly with the earlier stories and are critical to the plot. Through her, Eve learns about a man named Sebastian who takes in homeless girls and teaches them to steal. He, too, has potential to be a great recurring character. One of the things I like about the In Death books is the way the characters and their relationships evolve from book to book. Someone reading the first one, Naked in Death and then jumping to Concealed in Death would find Eve drastically different, but the differences have arisen gradually. There are some particularly lovely bits in Concealed in Death between Eve and Charlotte and Dennis Mira that wouldn’t have been possible in the early days of this series. Thankless in Death resolved some old issues for both Eve and Roarke, and it isn’t yet clear how these changes will settle. It’ll be interesting to see what new stumbling blocks Robb devises, if any, to complicate Eve’s work. The one downside to the book is that it wasn't as edgy as some others in the series. The murders all took place in the past, and there is not a sense of current jeopardy or urgency. Overall, though, it was an engaging and satisfying story. The In Death series is one of my favorites, along with Roarke. :) I love all the characters who have made all these stories so enjoyable. Thanks for the review. I can't wait to read it. Roarke seems to be a favorite of many readers, Carol! Hi, Carol--I love the characters, too. I especially like the way Eve's circle of friends has expanded as the series progressed. And yes, Roarke is just totally yummy! I have not read any of JD Robbs books. Its the case of so many authors and not enough time to read. I haven't read them either, Quilt Lady but I have many friends who rave about them. J.D. Robb is a pseudonym for Nora Roberts. Quilt Lady, I know what you mean! It's impossible to read everything. The In Death series can be read as standalones, but I think readers would get a better sense of Eve as a character reading in approximate order of publication. I've not read this series although I have some of the books in my tbr pile but I am totally overwhelmed with the amount of books in this series and I am guessing they should be read in order??? Actually, last year I read my first Nora's. Again, I didn't know where to start but I picked some of her stand alones and I really liked them. Catslady, it was reading this series that led me to investigate Nora's other books. I think you'd pick up on Eve's development better by reading the In Death books in order, or roughly in order, but they could be read as stand-alones. The In Death Series is intriguing and one of my treats. Thanks for this wonderful feature. Petite, obviously I love it, too. Glad you enjoyed the review! I am most interested in exploring this series and this book sounds captivating. thanks. Traveler, it's a great series. There seem to be quite a few of us who haven't tried this series yet. I've heard about it. I just haven't bought any of the books yet. I will have to give it a try. Laurie, if you like intense murder cases lightened with some humor and hot romance, I think you'd like them. Kim, I'd agree that Eve doesn't change much in the first couple of books, but as the very social Roarke plays a bigger role in her life, she does open up and grow, if reluctantly. Thankless in Death kind was watershed, I think. Hi, Anna--Glad you liked the review. I don't think I'll be a regular regular, more like a recurring cast member. :-) Because, yes, it's fun to hang here despite the way the TBR pile grows. I gotta say, the e-reader has played a great role in keeping books out of corners. I absolutely love this series. They are my favorite couple. Great review. Can't wait to read this one. Trish, thanks! I'm guessing you read Thankless in Death. Did you love it as much as I did, or was it just another installment for you? bn100, if you like murder mysteries with humor and hot romance, I think you'd like these. This is a good, solid series. I'm interested to see it open with Roarke. Thanks for the review. LSUReader, glad you liked the review! Roarke is as cool as always in the opening. Oh, Nancy...I have told myself that I will not start this series because I would have soooooo much catching up to do (as I'm one of those who likes to read a series in order), but you make me want to start it anyway!!! Great review! I have been looking at this series for years, but have yet to start it. I enjoy Nora Roberts' books, so that isn't what has held me back. When I worked at the library, I made sure we had all the JD Robb books available, as well as her Nora Roberts books. I think I never started them because I knew it was going to grow as a series and I would need to catch up and keep up. Now I am sorry I didn't go ahead and start. I have so many to catch up on. I enjoy seeing the growth of the characters and relationships, so I always read the books in order. I won't be getting to these last two for a long time. Thanks for the review. Don't be a stranger to the Dish. Thanks for the review. I really enjoyed it. I love Nora Roberts books, but haven't read any of her J D Robb books yet. Thanks for the giveaway! I love this book. And I do hope Quilla will be a recuring character, she has lots of potentials.